It’s not just children who organize their lives and experiences, and transcend them, through storytelling. It’s definitely not just for fun. The ability to feel empathy, informed empathy–an understanding of another that begins in earned, respectful knowledge of the other–lies at the heart of our moral understanding. We practice that, in so many ways, through storytelling. We use storytelling to hold onto memories of people we are heartbroken to have lost, and begin to heal our hearts in the process. We work to cross barriers of time and distance and race and class and gender. We hold our own selves coherent in our minds—all with the help of storytelling. Storytelling can also go wrong. We can tell a child a story about how he is wrong and bound to be wrong, and that story gathers power with every retelling. We can do that same thing, each of us, to ourselves. We can construct stories that hold an entire group accountable for the acts of a few, or revisions of history that scapegoat the blameless. We can cling tenaciously to old stories about the world around us, rather than let new evidence start us spinning new versions. Storytelling is like fire. We have to carry it and keep it alive, or we lose something essential–but we also have to carry it, and use it, very carefully. Storytelling gave power to our classroom learning at Touchstone in so many ways. For example, after my class had watched each video episode of The Voyage of the Mimi, kids wrote journal entries in the voices of the characters. At first, I asked all the students to write as C.T., the young character who is our surrogate within the video story. The second year, when I broadened the choices, I saw how much it could mean to a kid to write as the chief scientist on the expedition, responsible for both thorough data and respectful treatment of the whales they were tracking and observing. Some chose to write as the captain of Mimi, responsible for everyone’s safety and for the boat itself, but also committed to the success of the scientists who had chartered Mimi for their work. 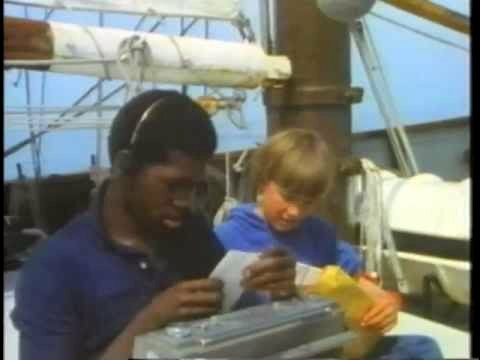 Many chose to write as the young black student intern from New York City, initially clueless about everything nautical, but an expedition-saving whiz at electronics–above all, willing to step out of his city-smarts for a new experience. Taking on these roles and perspectives gave students broader understanding of the trade-offs and decisions in real work. At the same time, creating that shape-shifting experience for themselves, they could feel their own imaginative power. The day I saw, in a Cambridge bookstore, a whole book devoted to Claudette, I hollered out myself, just thrilled. Seriously, find the book or at least read the Wikipedia entry linked above: you’ll be fascinated by all the reasons she wound up a mostly unsung heroine, and I hope you’ll feel as grateful as I do for the example of her Mighty Girl spirit. One year we had a little more time for this kind of work. I copied several accounts from Freedom’s Children, which described a variety of situations including a lunch counter confrontation. Then small groups of kids worked with the different stories. Before we shared with the class as a whole, we took time to have the participants in each group switch roles, and then run through the skit again. How did it feel different to be the white store manager? How did it feel to be the kid who took part but never spoke? How did it feel to be the one who stood up–or sat down and stayed sitting? A memory of a pivotal point in my own learning: a child started playing an elderly character in a stereotypical old guy way, shaky hand on cane, croaky voice–playing it for laughs. I can’t remember whether I just intervened briefly, and reminded kids of our purposes, or whether I conducted the kind of group discussion that often serves those purposes best. Sometimes quick and light is good; sometimes taking time to go deeper is good. Either way, over time, I realized that I wanted kids to carry themselves, collectively and consciously, the responsibility for real empathy in our role-playing. Informed empathy, considered empathy. Such a challenging thing, for them and for me: to enlist the playfulness and inventiveness of the imagination, and give it a sense of responsibility, all at the same time. To carry and use the fire of storytelling carefully. We do that best when we’re open with kids about the power we’re giving them, and its risks. Can people who’ve grown up in the invisible insulation of white privilege really understand what it’s like to be looked at askance every time you walk into a store, or to be pulled over every time you drive through a white neighborhood? I don’t think so, actually–not fully, although each of us has experiences on which we can draw, to move towards partial understanding of someone else’s story, and we have the power of transmitted language, stories others have told, to guide us. Still, I’ll stake my soul on the conviction that it’s worth trying; that what we gain from role-playing or from writing in persona is worth the risk–no, in fact the guarantee–that we won’t get it all right. Working with high school students as creative writers, I’ve use photographs (like the one to the right by Eudora Welty), other people’s poems, artist’s manikins, all sorts of prompts to encourage writing in persona, writing out of what we’ve learned but not consciously owned about what it’s like to be someone else. Again and again, I’ve been floored by the results–just as with my younger students. It’s never felt anything but risky, or anything but essential. The questions are part of the learning, and the caution is part of the imagination’s voyage–for all of us. 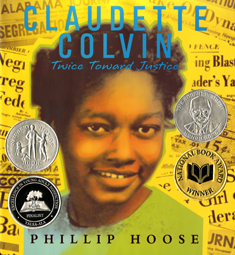 This entry was posted in Class life, History, Integrating the arts, Reading and writing and tagged black studies, Civil Rights Movement, Claudette Colvin, Freedom's Children, informed empathy, Mighty Girl, role-playing, role-playing to learn empathy, role-playing to learn history, storytelling, Voyage of the Mimi, writing in persona by pollybrown2013. Bookmark the permalink. I’ve long said that we tell stories over and over in order to find out what we know. That the story embeds our knowledge and we must re-enact it, re-experience it to hear it told to us. This is such brilliant and joyous work, Polly. I continue to grow from your blog. And old snippets of conversations we’ve had come back to me, refueling my sense of teaching.